In booking a Redi Bins bin, you are agreeing to fill the bin with allowable waste as described on the Redi Bins website. If you include unacceptable waste in a Redi Bins bin, this will be detected at the Transfer Station at which point the load you placed in the bin cannot be disposed of and the load will be returned to your property for you to dispose of. A return fee will also be charged to you to cover cost of re-loading at the Transfer Station. If you are uncertain at any stage about items you wish to place in the bin, please contact our operators for assistance. The quoted figure is based on the bin being filled level with the top edge of the bin. If you overload the bin beyond level with the top edge, you will be required to unload the bin to the correct level. Redi Bins will not accept overloaded bins as road fines can be issued for overloading bins that would then need to be passed on to you, the customer. The bin will be picked up from your property if it is not overloaded. If the skip bin is to be placed on your property for filling, your access driveway needs to be 3 metres wide with overhead clearance of 3.5 metres. You need to have the access areas clear of items, pets and children to ensure the bin can be placed safely. Your access area needs to be capable of safely withstanding the weight of a laden bin and the truck and you will be responsible for any soil spread by the truck tyres whilst accessing your site. The operator will take due care in delivering the bin on your property but cannot accept responsibility for pre-existing conditions. 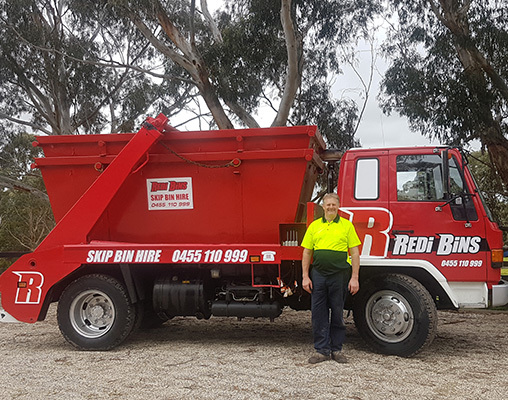 If the skip bin is to be placed on the naturestrip outside your property, the operator will arrange the permit for you with your local council and add the permit fee to your bin hire fee. Prices are listed in our Instant Quotes, however, prices may vary according to delivery locations. The operator will confirm the price according to your location at the time of booking. If you request the bin for longer than the standard 3 day hire, the operator will advise you of the additional fee for an extended booking. Light and heavy bins loads have weight limits. The price of your bin will increase if the weight limit is exceeded and you will be required to pay the additional cost, The loads of light and heavy bins are weighed after collection and if the weight limit is exceeded, the light bin becomes a heavy bin price and the heavy bin has an additional charge applied. The operator can advise you on the further charge rate per tonne for loads exceeding the heavy weight limit.